Everyone wins at Chicken Alley Art Show; all proceeds benefit Martha's Vineyard Community Services. 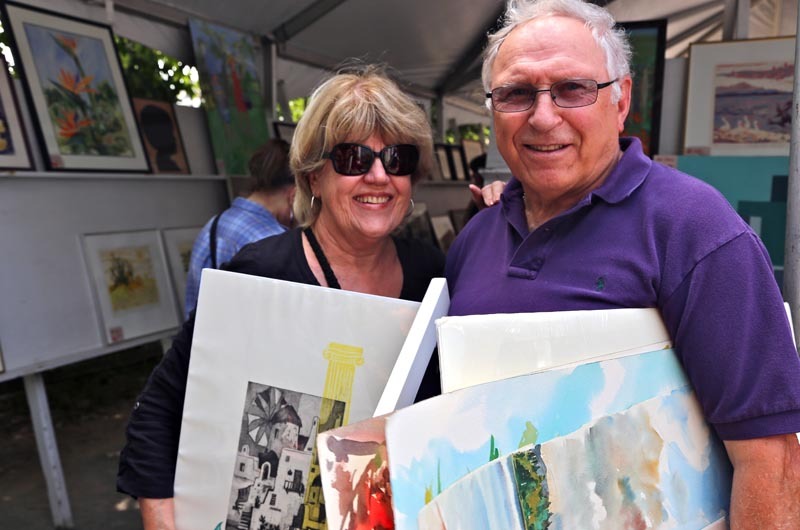 Most daytrippers come to the Island for sun and fun, but on Sunday Karen Long came for the art. Ms. Long traveled from Concord to attend the annual Chicken Alley Art and Collectable Sale. “I’m on the lookout for Asian art,” she said. After waiting in line for an hour and a half, she entered the tent to hunt for treasures. Others waited even longer — a line formed outside the thrift store at 8:30 a.m. Inside the crowded tent, attendees weaved in between each other, moving quickly to seek out undiscovered treasures. “We’re learning that we should be here earlier,” said Kathie Indigaro as she juggled art in her arms, several of which were by artist Stephanie Canizares who’s work she purchased last year and hoped to find more. “We’ve found some fabulous things,” she added. All year long, thrift shop volunteers set aside art and collectables to feature at the sale. A fashion show featuring local designers was held at the thrift shop on Friday night. The annual show was created in 2002 by Olga Hirshhorn who, as per tradition, sat in a rocking chair inside the thrift shop greeting visitors and saying hello to friends. One hundred per cent of the sale proceeds go to Martha’s Vineyard Community Services, which provides programs and services for Island individuals, families and the community. 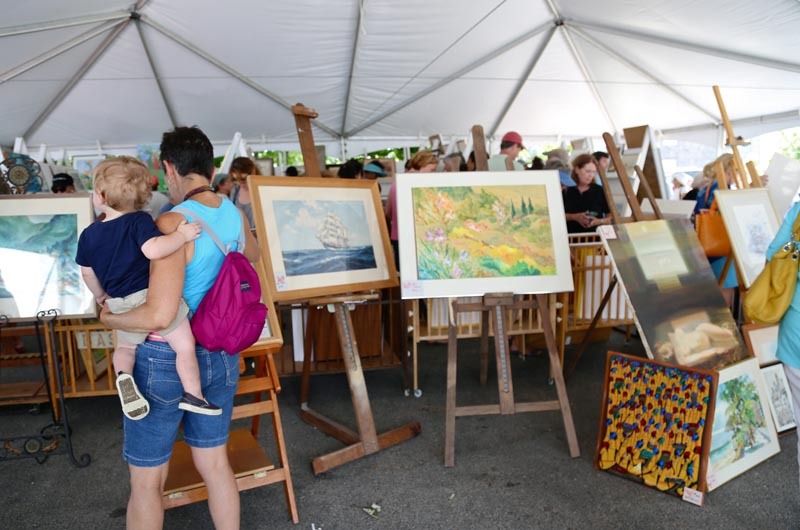 This year’s Chicken Alley art sale is Sunday, August 13 from 1 to 5 p.m.